It was 48 years ago this week that Alfred Hitchcock unleashed "The Birds," sending Tippi Hedren fleeing and changing forever how we look at our winged friends above. We'd like to imagine that suspense-master Hitchcock, who also wielded a perverse sense of humor, would be getting a kick about the "Angry Birds" videogame phenomenon, which is spreading with the debut of a new app. 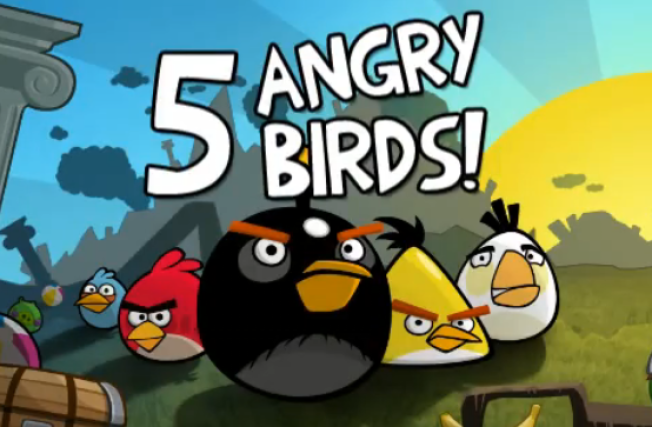 The "Angry Birds Rio" game is a tie-in to "Rio," an animated flick set for release next month. We'd also like to believe that Hitchcock also would be chuckling over some recent "Angry Birds" spoofs, courtesy of Conan O'Brien and an outfit appropriately named Rooster Teeth. A Rooster Teethvideo, a mock trailer for an "Angry Birds" movie as made by "Transformers" director Michael Bay, debuted on YouTube Saturday is showing signs of going viral like, um, the bird flu. And with good reason: it's a clever send-up of action movies with familiar characters and scenarios (the torn young hero called back into action by the grizzled old military commander), along with hackneyed dialogue/laugh lines like, “Is this some sort of game to you?" O'Brien, meanwhile, has been cracking us up with his life-sized "Angry Birds" setup, using a giant slingshot and balls representing the birds to bring down the house on the likes of the cast of "Jersey Shore." "Angry Birds," the creation of the Finnish company Rovio, is "Finland's great contribution to mankind," O'Brien declared on his show earlier this month. With more than 100 million downloads, the new app, planned plush toys and "rubber playground balls" (read: dodge balls) – and talk of TV and movie spinoffs – the folks at Rovio should be able to withstand some jokes slung their way.